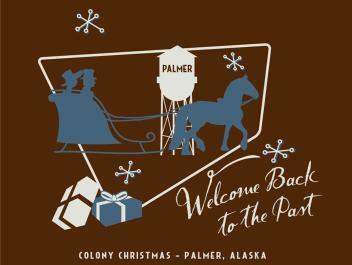 This weekend, Colony Christmas takes over downtown Palmer. For my money, it&apos;s one of Alaska&apos;s best community celebrations, as the entire town takes on a "Norman Rockwell" Christmas feeling. From fresh baked cookies to craft fairs to fireworks, there really is something for everybody. Colony Christmas really does transform the town into a magical feeling of holiday joy. There&apos;s just something "down home" about sipping hot chocolate as the annual parade of lights makes it way through the streets. Or being all bundled up as the fireworks light up the evening sky. Throughout the years, Colony Christmas has become a holiday tradition for many families, and better yet, it&apos;s a great way to support local businesses and artists. Take a minute and shop the downtown Palmer stores - chances are, you&apos;ll find unique Christmas gifts, and things you never even knew you needed. Then take a stroll to one of the many craft fairs that take place during the weekend. Local artists sell their creations, and it&apos;s a great way to shop locally this holiday season. Then head over to the Palmer Visitor Center to meet with the reindeer, take a hay ride and enjoy the afternoon. Saturday night, get gussied up and head to the Holiday Ball at Raven Hall. There&apos;s so much going on, from kids games to triathlons, cookie bakeoffs to gingerbread house designs. For a complete schedule, visit www.palmerchamber.org, but it&apos;s just as easy to just show up in downtown Palmer and let your holiday cheer be your guide. You won&apos;t be disappointed with spending an afternoon jazzed about Christmas!